As Australia’s longest running aviation degree program, UniSA’s Bachelor of Aviation has been a huge success, graduating both pilots and aviation management professionals now employed across Australian and around the world. Head of the program, Dr Doug Drury says the collaboration with Qantas will bring about important benefits for students and the aviation industry. “Latest industry reports show we are entering an era of very high demand for quality pilots,” Dr Drury says. 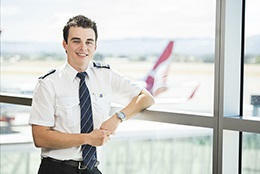 “Across the next 20 years the demand globally will exceed 640,000 pilots. UniSA Vice Chancellor Professor David Lloyd says the MOU is another example of how connecting with industry has important benefits for students. “Collaborations such as this one with Qantas are invaluable for our students because they underpin deeper engagement with industry and present real opportunities for them to understand what they are learning in the context of how they will apply that in their working world,” Prof Lloyd says. QantasLink Chief Pilot Adrian Young says the Qantas Group Future Pilot Program is about building the next generation of exceptional pilots from within Australia’s top aviation schools and in return providing students with benefits and placement certainty. “As the national carrier we have a history of attracting the best and brightest to fly for us,” Captain Young says. “The students chosen for this program will have an enormous head start to their career as a pilot. “They will benefit from a direct pathway to Australia’s largest regional airline and access to our experienced pilots throughout their studies.